At one time in Roy Underhill’s storied career, he was master housewright at Colonial Williamsburg. In 1979 he created the PBS series The Woodwright’s Shop, which became one of American’s leading how-to television shows, inspiring millions of viewers to take up the bench. The Woodwright’s Shop is written with the most engaging sense of humor and illustrated by over 300 photographs. Underhill offers historical background, folklore, and era-bound technology as he introduces and details traditional woodworking. 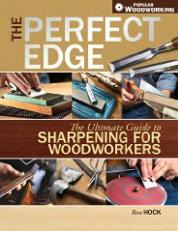 Underhill, aka Saint Roy, begins with a guide to trees and tools, and then moves on to chapters on gluts and mauls, shaving horses, rakes, chairs, weaving wood, hay forks, dough bowls, lathes, blacksmithing, dovetails, panel-frame construction, log houses, and timber-frame construction, as well as the author’s descriptions of the shoulders woodworkers in America stand upon.